After President Obama’s comments on climate change during the State of the Union address, a new poll by the Natural Resources Defense Council affirmed once more that Latinos support taking action on climate change. This is important to note because there are a variety of reasons why we need to take action on climate change. Much of the discussion has been regarding the science and causes of climate change, along with some of the ecological and physical changes that would come from a changing world under climate change duress—think of melting glaciers and endangered polar bears. But another issue that has also been key is the direct impact of climate change on us, humans—especially when it comes to health. It has been fairly clear how general environmental health disparities exist for communities of color, but it is important to ask and note: How do we connect health regularly to climate change? There are certainly a host of issues connecting health and climate change, from the effects of increased algal fish blooms, increased pests like mosquitos, dirtier air, and extreme heat waves. The key is how it affects people and how we look at this from a public health perspective. As Latino communities, this is a strong issue on which to rally because as with many disparate environment effects, it is communities of color that are usually “hit first and hit worst”. This is not to mean that this is merely a self-interested look at climate change. Itdoes matter that we are wiping out habitats and endangering species through climate change. But the connection to saving the polar bear is not as concrete an issue for many communities that do not have the same privileges as more affluent communities have with the outdoors. This is also not to say that Latinos and communities of color do not care or are not able to grasp the concept of threatened species and melting glaciers—it is a simply a reality that more pressing issues are the health of their children, or losing access to affordable food and water. The good news is that many communities of color have clearly made these connections and have begun taking action. The call now is to keep stressing these points so that we can save the polar bear, and our health--Hay que tomar acción por el planeta, nuestra salud y nuestras comunidades. 2012 closed with an interesting note: As noted in this article from Reuters, the term “fracking” was more popular than “climate change” in US online searches. Fracking, the common term for hydraulic fracturing, was across the news in 2012 as shale oil and natural gas extraction took off. For anyone unfamiliar with the term or process, it is essentially breaking up rock with pressurized fluid in order to release oil and natural gas. But the process comes with reports of concern about the side effects on the environment and nearby communities—and as the Matt Damon-produced movie “Promised Land”, hits the theaters, fracking is cresting to be a key environmental debate. But does fracking resonate as a Latino issue? Are there a significant number of affected Latino communities? Is the opposition to fracking embedded with Latino faces? This tends to pit at-risk communities with the workers in the fields, and with Latinos being framed as enemies in the process instead of as potential allies. The concern is that the anti-fracking movement could suffer from the same concerns of other conservation efforts. “Indeed, a continuing challenge for progressives in the U.S. today is the need to build a bridge between environmental and immigrant defense and workers’ organizing rights movements. The divide between the green, the brown, and the blue needs attention. But Latino communities may also be at risk from the environmental effects of fracking. Low-income communities and especially communities of color have long lived with concerns over contaminated water. But contaminated water from fracking is a relatively new issue that did not really take off until this past decade with rural white communities—and it may be that for Latino communities it is simply underreported, especially in areas of Southern California and the colonias of Texas. In California, with the discovery and development of what is known as the Monterey Shale, fracking may be added to the host of environmental challenges Latinos face there. While a big focus has been on how it will affect Monterey County agriculture and wine country, the shale field extends into the San Joaquin Valley, home to many Latino communities. The process is moving forward, and many of the debates had in other parts of the country are arriving in California. With its significant Latino population, it will be interesting to see how Latinos continue to be part of the debate at the state level and nationally. Some Latino voices have made it part of the dialogue. But in order avoid some of the pitfalls of other conservation issues, the environmental debate over fracking may be in need of some Latino perspectives. This past week two stories stood out identifying two communities of color different in many ways but connected by a common challenge: contaminated water. The irony is that many of these communities are farm-working communities that work the very fields and industries that poison their drinking water —and in that process these communities bear the cost of food production in more than one way. First, we rely on communities like these to serve as a labor force for the food we consume, the dairies and crops of California’s bountiful bread basket. But the political and economic forces that govern these areas keep many of these communities in poverty with low wages or uneven enforcement of the few regulations in place to protect them. Second, these communities struggle with limited access to the basic needs some of us take for granted, such as drinking water. These communities are asked to pay twice for water. They pay first for the tap and second in the purchase of bottled drinking water. Furthermore this pushes habits we consider detrimental to sustainable living: In the larger conservation community we stress the detrimental environmental effects of bottled water and yet that is the safest and healthiest option for these communities absent state and regulatory action. Those are good questions, but questions and issues that not all communities face— Yet common enough in communities of color. 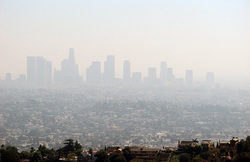 L.A has been quite the laboratory for Latinos and environmental issues. Definitely because of the huge Latino population there, but also because of the very clear environmental problems that the communities are exposed to. Communities and groups have mustered the strength to start the fight against the problems and also have begun to redefine what it means to be an environmentalist in the contexts of the barrio. I think more and more of these stories will be coming out. When I was doing research on these topics (the fruits of which I hope I'll be able to condense soon enough...) I was finding that it was there were few mainstream publications and news outlets mentioning the struggle, and of course, community groups have few resources to devote to websites and media outreach. But big organizations are beginning to take up the issues (for good and bad) and be more responsible about them, and the grassroots are not going to be going away. 5) Latinos need to be part of the discussion and solutions, not just the "victims"